NYC Votes wants to hear about your voting experiences and concerns from the 2016 elections. 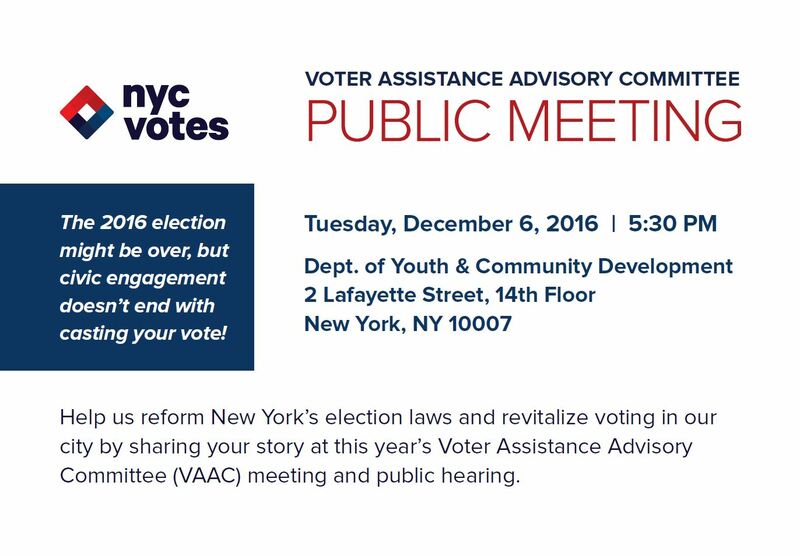 NYC Votes' Voter Assistance Advisory Committee (VAAC) will hold its annual public hearing at 5:30 PM on Tuesday, December 6th in lower Manhattan. Come share your insights and help us improve our voter education and outreach efforts. If you plan to attend, please RSVP here. If you'd like to testify at the hearing, please contact Sabrina Juarez of the Campaign Finance Board's Voter Assistance Unit at sjuarez@nyccfb.info with your testimony. Members of the public will have three minutes each to testify. NYC Votes is the nonpartisan voter engagement campaign of the New York City Campaign Finance Board (CFB) and its Voter Assistance Advisory Committee (VAAC). In addition to promoting voter registration, participation, and civic engagement in New York City through its many programs and partnerships, NYC Votes sponsors the city’s official Debate Program and produces the citywide Voter Guide.